Despite what we tell ourselves, there’s no such thing as a quick trip to the supermarket, writes Lucy Kippist. Oh, the lies I tell myself on the way to the supermarket with both my boys in tow. We’ll just zip in and out. They’re almost 5 and almost 2, they should be OK.
I’ll just be really fast. Except that we never do. Because we never can. Zooming down the aisles is practically impossible, items are crossed off, new ones put on and demands come from left, right and centre. So how do you survive a trip to the supermarket on the days when online shopping or – sigh – going by yourself just isn’t an option? Here are 7 tips from seasoned parents who are clever enough to head in with a game plan. If ever there was a parenting lesson worth learning, it’s getting creative with the word: ‘no’. So the next time you’re swatting your kids away from the Kinder Surprise, blogger Angela of Creative Kids suggests you try saying: “This is no good, if we eat it our bellies will hurt,” or “This is only for big people”. Clever, right? Make all that loud commercial packaging and signage work for you by using them to learn numbers, letters and words. You can even count the lemons or oranges into a bag, or make sure there are enough eggs in the carton. As you’re making your way through the aisles, talk about what you’re buying and what you’re going to make with it. 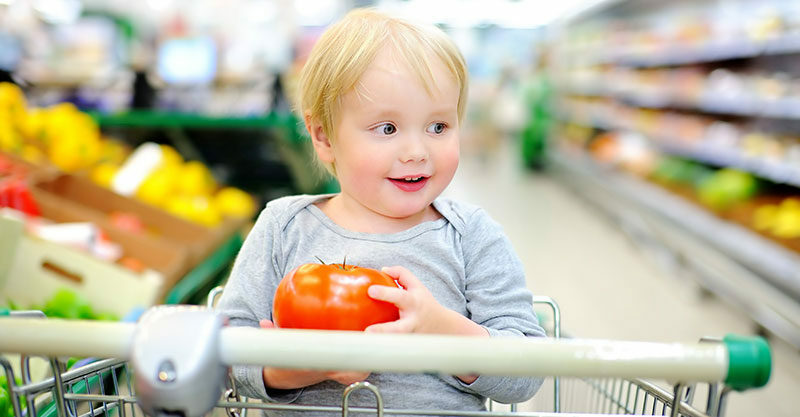 Ask your little one to point to certain colours or products on the shelves. This could even start at home while you’re writing your shopping list. A distraction technique from way back! Put a basket or your carry bag in your little one’s hand and tell them to “help” you by carrying the light items. Personally, I’m still learning this lesson as an adult! But imagine the zen if you all ate a snack before you even got to the supermarket.